Enter the combined total of all qualified retirement plan account balances. Enter your current age (must be greater than 20 and less than 70). If you are 70 or older, please visit the age-appropriate calculator link located within the Help tab. Select the month you were born in. This is used to determine whether you are to start making distributions at age 70, or at age 71. This online IRA Growth and Distribution Calculator will attempt to forecast the future growth of your IRA, as well as the required minimum distributions (RMDs) that will begin once you reach age 70-1/2. Specifically, the calculator will generate a year-by-year chart showing the estimated growth of your IRA accounts. This includes the annual addition of your interest earnings and the annual subtraction of your estimated minimum withdrawals -- all the way up to age 113! 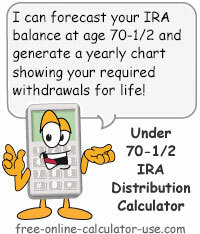 If you are already age 70-1/2 or older, please use the IRA Future Withdrawal Calculator for forecasting future required distributions. Or, if you are already age 70-1/2 or older and you would just like to estimate your current required minimum distribution, please use the IRA Current RMD Calculator. Enter the current combined total of all of your IRA accounts. Click the "Forecast Growth and RMDs" button. This will display a year-by-year chart showing the effect of your future interest earnings and minimum required distributions. When Do Minimum Distributions Start? The IRA Growth and Distribution Calculator is based on Table II (Joint Life and Last Survivor Expectancy) and Table III (Uniform Lifetime) Table from IRS Publication 590-B (2014) (opens new window).